Sister Josephine Fritz has a favorite chair in the lounge at the retirement community, and its not the stereotypical rocking chair. At 100 years old and sharp as ever, Sister Josephine has earned her spot. 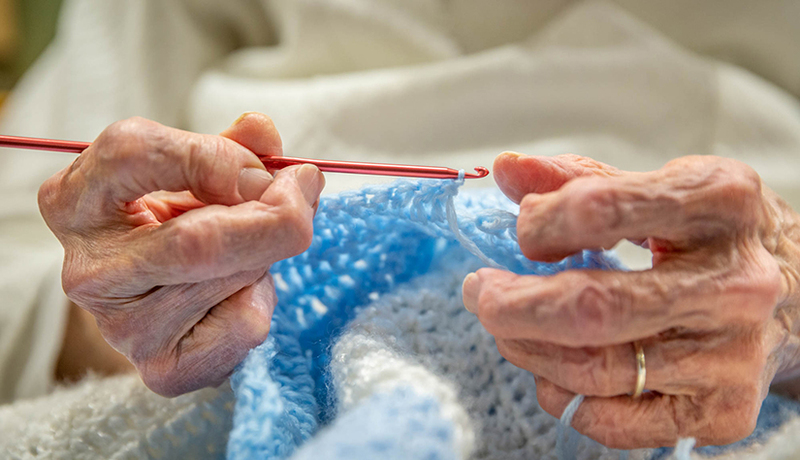 And she doesn’t just sit and observe — she’s busy crocheting baby blankets for clients of Birthright. Helping the agency is her way of showing the women served by Birthright that someone cares about their unborn children, so they will choose life for their baby. Sister Josephine Fritz crocheted baby blankets for Birthright. Sister Josephine received some money as gifts for her 100th birthday, which she used to purchase baby outfits for Birthright. “I look like a bag lady,” Sister Josephine said, laughing about the bags of yarn she totes on a cart she uses to balance herself as she walks. At a celebration of her 100th birthday, the Sister of Good Shepherd received gifts of money which she used to purchase 102 “onesies,” lightweight one-piece baby outfits she delivered to the Birthright in north St. Louis County. Her efforts continue a lifetime of helping women and children. Growing up in Detroit during the Depression, she watched her parents make many sacrifices. She wanted to be a Maryknoll missionary, serving in China or another foreign land, noting that “the Lord kept nudging me.” But she tested positive for tuberculosis — a spot on a lung — and “that was the end of my going to the missions,” she said. She had driven past the Sisters of the Good Shepherd, heard good things about the community of apostolic and contemplative sisters and saw a movie “on the big screen” about them. “I saw a sister in a chicken coop collecting eggs. I thought it was a real sign from God that’s where He wanted me,” she said. Of course, she added, it helped that she wasn’t asked about the tuberculosis test. “They took me in,” Sister Josephine said. She began her religious life as an apostolic sister, making her final profession in 1945. Her teaching career began as a substitute in primary school classes, “a pinch-hitter,” she called it. Eventually she became a house mother for middle-schoolers, earning a reputation for being able to handle the the tough kids. Telling of one particularly unruly group, she said the students eventually settled down, got into their work and sports. They won several championships. Sister Josephine served as a teacher mainly in Ohio, Michigan and Indiana. She returned to school, attending Saint Louis University and earned a master’s degree in social work. She achieved her goal of serving as a missionary in 1979 when she was asked to serve in Guam. “I guess they didn’t know what to do with me anymore,” she said with a laugh. There, she helped open a house for abused women and their children. “It hasn’t been boring,” Sister Josephine said. At age 80, she began using a computer. In 1987, after returning from Guam, she decided to transfer to the contemplative community after feeling drawn to that. It was there, in Baltimore, where she and other sisters formed a crochet club. She formed another club upon moving in with the contemplative sisters in St. Louis in 1995. Sister Josephine, who teaches crocheting to anyone who is interested, is appreciative of the donated yarn that she receives. A few years ago Rose Vierdag, who serves as a liaison picking up the blankets from the sisters, posted an announcement in the bulletin of Sacred Heart Parish in Florissant around Christmas, asking for yarn in honor of the Baby Jesus to be donated to the Sisters of the Good Shepherd. The response was gratifying. Sister Josephine lives at the Masone Pointe Care Center with several other Sisters of the Good Shepherd where they attend Mass and regularly pray in the chapel. She prays the Rosary with another sister at the bedside of a fellow sister who’s in hospice care. Sister Nora O’Flannigan, left, talked with Sister Josephine Fritz before dinner with the Good Shepherd community at the Mason Pointe Care Center in St. Louis. Sister Josephine, who is 100 years old, served as an apostolic sister for many years before joining the contemplative community. 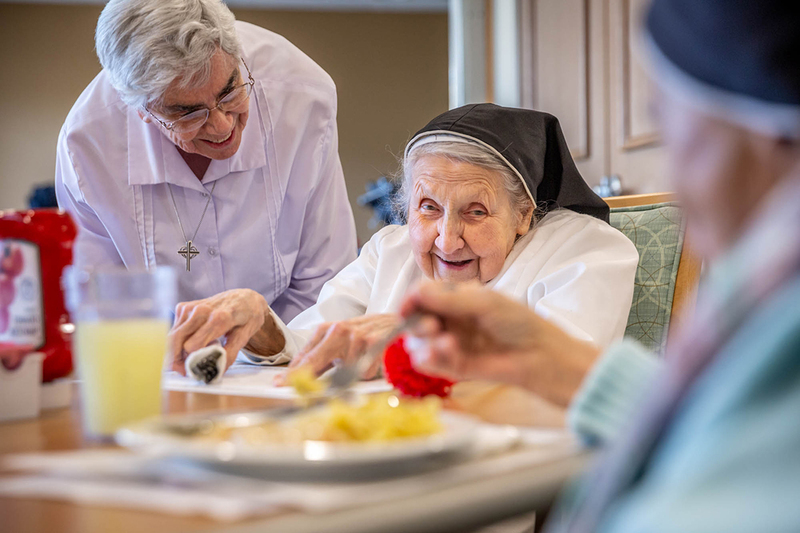 The Sisters of the Good Shepherd moved in mid-December from their longtime home at Immaculate Heart Convent in Normandy to a new home 18 miles away at Mason Pointe Care Center in west St. Louis County. Lutheran Senior Services, which operates Mason Pointe, prepared a special area for the now 25 women religious to live together. They receive long-term care, assisted living and eventually independent living services, along with a newly built chapel for daily prayer. The chapel includes two large stained-glass windows from Immaculate Heart Convent. One window features the Sacred Heart of Jesus. The other represents the Immaculate Heart of Mary. The windows were handcrafted in Germany and have been a part of Good Shepherd since 1924. Immaculate Heart Convent was no longer suitable for the needs of the aging sisters. Lutheran Senior Services provided job opportunities for the staff at Immaculate Heart. Mason Pointe also has room for more sisters in the future. • An international congregation, with an apostolic and contemplative lifestyle. Their official name is Our Lady of Charity of the Good Shepherd. • Express their charism together with mission partners in 72 countries. • Energized by their understanding of God’s love, they build partnerships that promote the dignity and human rights of all, especially women and children. In solidarity, they work for the transformation of unjust systems, the flourishing of humanity and integrity of all creation. • They take a fourth vow — zeal — which is love in action manifested through their mission. Apostolic sisters live their mission of reconciliation, empowering lives, restoring rights and upholding dignity through active ministry. They address the pressing global and local needs through relationship-based programs that address the needs and aspirations of persons and communities. Contemplative sisters witness to the absolute primacy of God and seek to be a means of reconciliation by prayer, faithfulness to the Gospel, solitude and silence. They hold in prayer the universe and support the endeavors of sisters who are engaged in the active ministry of reconciliation. For more information, visit www.sistersofthegoodshepherd.com. Besides ongoing individual and group counseling, there are classes available on parenting skills and forming healthy relationships, as well as financial assistance with rent, utilities, transportation, food and medicine. A scholarship program provides assistance to mothers in school. Counseling also is available for postpartum depression and for women who have had an abortion.